Tuna flakes with a little chilli and garlic infused extra virgin olive oil (5%) and spicy red pepper couscous. Carefully selected premium spices, blended with extra virgin olive oil and drizzled over succulent Tuna. John West Infusions, simple delicious! This one really packs a punch! 2 Simply add boiling water to fill line (approx. 135ml). Then give the couscous a stir. Take care not to under or overfill, we want your couscous to be perfect! 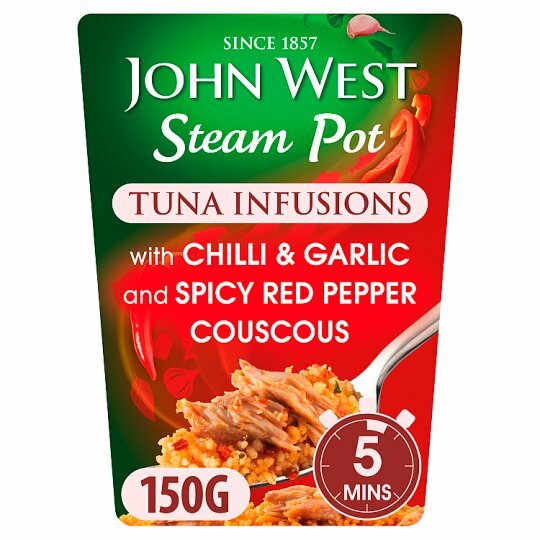 4 Add the John West Infusion with Chilli and Garlic to the hot couscous and stir. Mix in a little at a time if you prefer.